YVONNE BUCHAN'S DREAM IS MOVING SWIFTLY TOWARD REALITY, and the house is becoming the spectacular residence she once only imagined. As I walk through, stepping carefully around the construction materials, I see the original house blending with the new addition to create a beautiful new home. The great room is taking shape, anchored by the fireplace at one end. The entire house has been sheet-rocked, hardwood flooring has been laid and, in the upstairs master bath, a large cardboard box looks like it contains a tub ready for installation. But the real drama is unfolding on the second floor. I cautiously pick my way up the stairs to the loft, where I pause to enjoy the ever-changing views of the river. Destined to be the owner-s private retreat, part of the loft houses a room that might be an office or a sitting room overlooking the living space below. Down the hall is the master bedroom suite, which will include large closets and a spacious bathroom. Large porches designed to catch the breeze on the front, side and back of the house are nearing completion, as is the private balcony off the upstairs master bedroom. The construction site is a beehive of activity inside and out. On my second visit, it was "Ladies Day," as a bevy of women painstakingly painted the exterior trim. 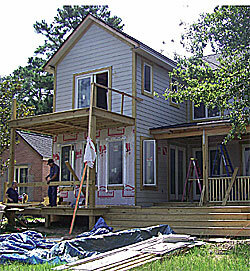 It is now possible to see not what the house was but what the house promises to be in just a few more weeks.